Going home for the holidays? 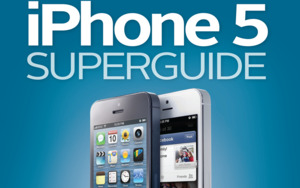 Keep the tech talk off the table this year by answering your family’s tech support questions with a copy of Macworld’s Mac Basics Superguide, now updated for Mountain Lion, now available for your Mac, PC, iPhone, iPad, Kindle, or Nook. As we’ve all experienced at one point or another, helping a family member set up a new Mac is both exciting and terrifying: They have something that’s entirely theirs to customize, tweak—and occasionally screw up. And as easy as Macs are to learn and set up, it’s always a little daunting to deal with a new computer if the end-user isn’t tech-savvy. 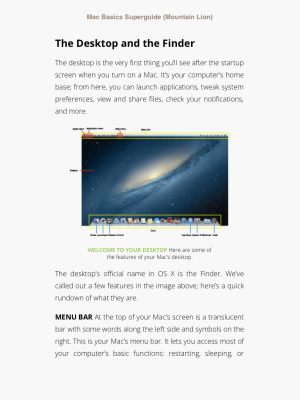 That’s why we make Mac Basics, the Macworld Superguide dedicated to getting started with all things Mac. There are plenty of manuals and guides that explain every single system feature and setup detail; this book is instead designed to actively get you (or your family member) up and running without making you feel like you’re studying a textbook. Our 230-page book has you covered from the first time you turn on your Mac. We walk you through the setup process and transferring any old files you might have; and introduce you to the menus, windows, and places you need to know about to get going. From there, we help you customize Multi-Touch gestures, organize your files, and tweak your preferences. We’ll get your Mac suited up with third-party apps and accessories. And you can follow our troubleshooting tips and security suggestions to keep your computer safe and sound. Your family member won’t find everything they need to know about the Mac in this book. (That’s what you—with the help of Macworld.com—are for.) But we hope it can provide the tools they need and makes them excited to learn more. To get our Mac Basics Superguide right away on the device of your choice, you can purchase it now from the iBookstore, Kindle Store, Nook Store, or as a PDF for $9.99. Or for $12.99, you can purchase our ePub/MOBI/PDF bundle and have a version for every possible device. Want to take a peek at the book before you purchase anything? You’re welcome to check out a free sample from our website. If a family member is debating the upgrade to Mountain Lion, you might instead consider gifting our Total Mountain Lion Superguide, which collects all our top-notch Mountain Lion coverage into one easy-to-read ebook. And if they’re insistent on staying with Snow Leopard, there’s always our Snow Leopard version of Mac Basics. If your family instead demands tech support for their iPhone and iPad, we publish plenty of those books, too: We recently released the iPhone 5 Starter Guide, iOS 6 Upgrade Guide, and a guide to help you Master iPhone Photography.